Actions have consequences--and the ability to learn from them revolutionized life on earth. While it's easy enough to see that consequences are important (where would we be without positive reinforcement? ), few have heard there's a science of consequences, with principles that affect us every day. Despite their variety, consequences appear to follow a common set of scientific principles and share some similar effects in the brain--such as the "pleasure centers." Nature and nurture always work together, and scientists have demonstrated that learning from consequences predictably activates genes and restructures the brain. Applications are everywhere--at home, at work, and at school, and that's just for starters. Individually and societally, for example, self-control pits short-term against long-term consequences. 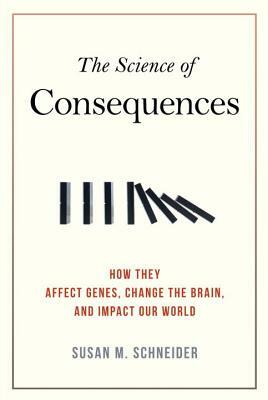 Ten years in the making, this award-winning book tells a tale ranging from genetics to neurotransmitters, from emotion to language, from parenting to politics, taking an inclusive interdisciplinary approach to show how something so deceptively simple can help make sense of so much. "A wide-ranging and highly entertaining guide to the many ways that the behavior of humans and other animals—from bugs to bonobos—is shaped by consequences. . . . An enjoyable and enlightening book for anyone who is curious about behavior and what makes it tick." "Biopsychologist Susan Schneider, a protégé of twentieth-century behaviourist B. F. Skinner, reveals the effects of actions' consequences on evolution, the genome and the brain. Learning from consequences, she argues, helps to reconfigure the brain across species. And, she avers, such insights can inform real-life applications, from the treatment of depression to solving global issues such as overfishing." "This book will be an eye-opener. . . . Schneider shows how flatworms, rhinos, day-old infants, and adults with dementia—all creatures great and small—are in the business of getting rewards. . . . With telling examples from everyday life . . . this book places the puzzling miscellany of human experience in much-needed context."